Geometry Dash originally released for mobile devices back in August 2014, and a new port of the game has been brought to Steam for PC and Mac, though the new content comes with an increased price tag. Geometry Dash is a difficult endless runner that can be compared with the likes of the Bit.Trip Runner series or The Impossible Game with the object of each level being to make it from the left side of the map to the right while always being pushed forward by the game's momentum. The game rides a thin line between a tough difficulty setting while still remaining fair, and the result is a game that is easy to enjoy for fans of the genre that most gamers will know their feelings towards before ever downloading the title. For what it's worth, Geometry Dash has a good sense of progression that begins with some very intermediate levels that most gamers that have delved into the platform genre will be able to complete with relative ease. The game gets more difficult as players progress through each level though, and some gamers will wonder if they will ever be able to complete the game over the last few levels. There is a good amount of content included for a game originally for mobile devices, and the game is still worth the extra money on Steam for those that have yet to try out the new game. As with any game in this genre, having tight, responsive controls is everything. The game works well on Steam and does come with controller support for gamers that are not as skilled with keyboard and mouse. The game is constantly moving forward, and players can choose to continue running across the ground, jump once or jump continuously in order to progress through levels. The game also introduces items in the environment that can be used to jump, hover and perform other tasks just by coming in contact with the item. All of these factors must be considered when players are forced to make quick decisions on how to best avoid spikes, pits and other hazards in any level. Geometry Dash has a couple of neat features that helps set it apart from other games in the genre. Customizable characters are one of the most advertised features of the game. Players can choose the shape and color of their character between levels, and additionally, icons can be unlocked that are used to add funny drawings or faces to their character. The content is rather shallow, but it does give players a little something extra to do within the game to make new runs feel less repetitive. The game also includes a nice Practice mode that allows players to play certain sections of levels over and over again until the section has been mastered. Practice mode offers a good way for players to learn levels without dying constantly and being forced to return to the start of a level in order to retry the difficult section of the current level. One other neat feature included in Geometry Dash is the game's built-in level editor. 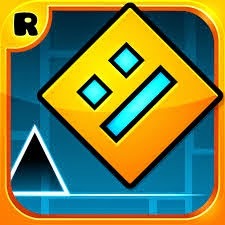 Players can create and share their own levels in the game using all of the same parts and pieces developer Robtop Games used to create Geometry Dash. The system is easy to use and works well with PC controls to allow players to easily cycle through inventory screens and place items exactly where they are needed without the need to fumble through touch screen controls along the way. Geometry Dash has a solid presentation. Nobody will pick up Geometry Dash for its graphical prowess; the game uses basic shapes and colors to craft its levels, and playable characters in the game are even more simplistic and rather boring to look at. What the game does incorporate well is a fantastic soundtrack that makes the game almost a rhythm title. Themes play in the backgrounds of different levels, and players' forward momentum typically seems to be right in line of the current beat of the song being played. The game's soundtrack includes some really catchy, retro-inspired themes that really makes the game more immersive than it looks at first glance. Geometry Dash isn't one of the prettiest games we've seen, and the game's difficulty spike is not for the casual gamer, but the title is a solid entry to the runner platformer genre and well worth trying out for fans of these types of games. The title includes enough content to make it worth the premium price tag on Steam, though it's a fun experience on any platform. Geometry Dash is out now for PC, Mac, iOS and Android. Geometry Dash is now available for PC, Mac, iOS and Android. For more information on the game, check out the official Geometry Dash website.